This particular Scrub was located at the end of the large looping trail as I was heading back to the park’s visitor center – note, not the visitor center for the ampitheatre itself, but rather the parks other gift center. It was busy making life for a few bugs very stressful.. and very short. So goes the circle of life. From a personal benefit perspective, it was so preoccupied with the feeding that it didn’t even mind The Beast pointed right at it for what turned out to be an extended period of time. Being so close to the grassline, my glass kept thinking I was trying to take a stunning photograph of a weed instead of the more colorful subject standing near it. Eventually got it focused in but not before burning some serious memory card space. But that is cheap these days so no harm and sure enough a few came out good enough to feature here. Best of all, I was able to channel my brother Ron and make sure I had plenty of different angles for you to enjoy .. and ID, but in this case that was not a big deal. If you see that pale blue coloring, match it up with the fine white eyebrow and the grey backpack you pretty much pegged the reference page. Might as well go ahead and give a look at the rest of the features best viewed from the front – head turned as well so you can see the matching eyeliner. So, let’s talk about that nuance I alluded to earlier in the post. 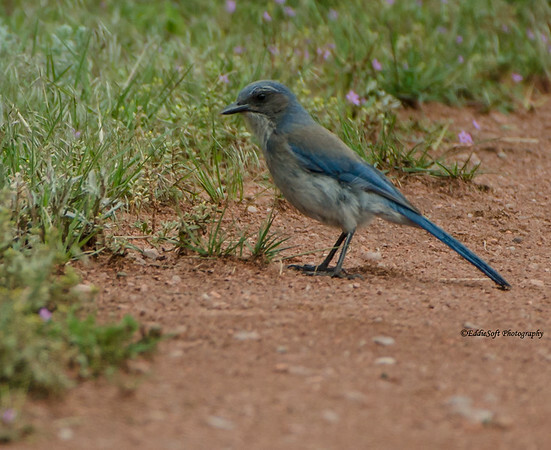 If you recall, I referred to this as the Western Scrub-Jay. Maybe seeing that name prompted you to pop over to Cornell and do a little research on it yourself. It is a pretty bird. If you did, then you probably already know what is coming next – you would have come up empty or with some alternative names depending on how you did your search. “How odd, this birding dork is telling me this bird is a Western Scrub-Jay and the premier birding site doesn’t even know what the hell that is.” Kind of reminds me of the ongoing discussion I have with my brother regarding the Black Hawk. 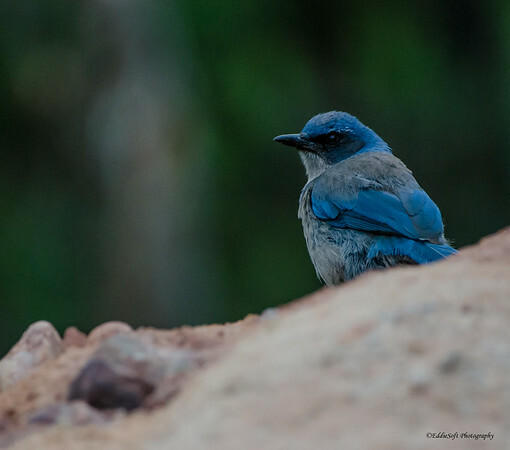 Time to come clean – this is not a Western Scrub-Jay… but it used to be! Turns out the bird authorities (whoever they might be) decided to break the Western Scrub-Jay species into a three new species. 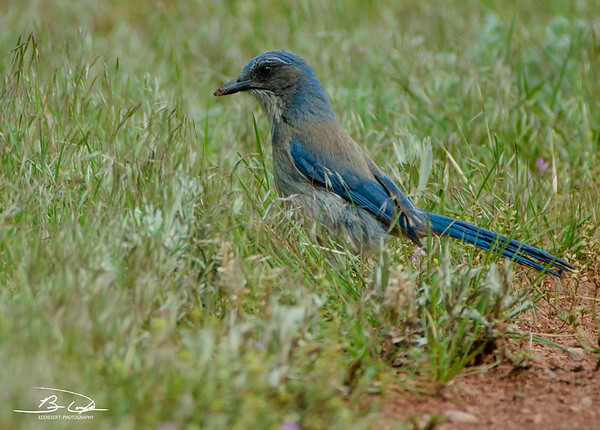 So now we have the California Scrub-Jay which hangs out in … brace yourself… California. Another was the Island Scrub-Jay which Cornell really doesn’t acknowledge, but our friends over at Wikipedia claim hangs out in the Santa Cruz Island area. 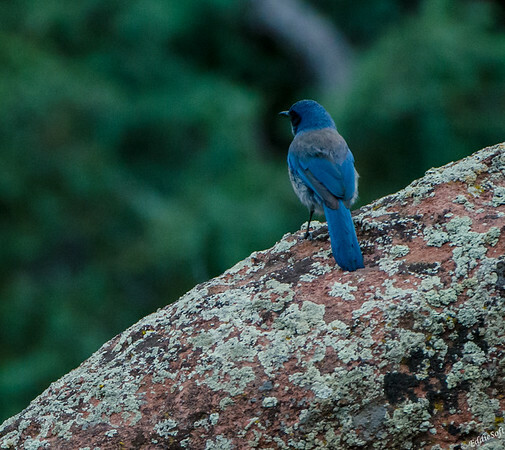 Lastly is the Woodhouse’s Scrub-Jay which obviously hangs out in the Western states short of California. So as of 2016 – no more Western, hello two new opportunities in my birding list. In case you are wondering, it was named after naturalist Samuel W. Woodhouse who spent time investigating the Southwest from 1849-1852 (according to the Audubon website). Quick, what do you see here…. First impressions? If you saw a dog or a bear with a Woodhouse’s Scrub Jay on the nose you are a) a fast learner and b) psychologically normal. I remember looking across the rocks and seeing this interesting rock shape and immediately thinking – need a picture. It probably would have been interesting even without the bird, but it was like a cherry on top that added that extra dimension/interest. It also reminds me of the bear rock I spotted in Yellowstone (link here). That pretty much puts us at the end of the post (pardon the image pun but you should be used to that by now). Net results was no change in the overall bird count, but that was do to removing the Western and adding the Woodhouse’s. To be honest, I might just stick with the Western Moniker – similar to why I stick to the Moorhen name (one reason is it is easier to remember – Gallinule is too hard to remember and always require a Google search to figure out how to spell it – I can guess the Woodhouse’s spelling easily enough, but nowhere as easy as saying – “Hey, that’s a Scrub-Jay and I’m physically standing in the West half of the US – obviously a Western Scrub-Jay” … wrong – thanks for playing. So I guess I have a California Scrub-Jay now. 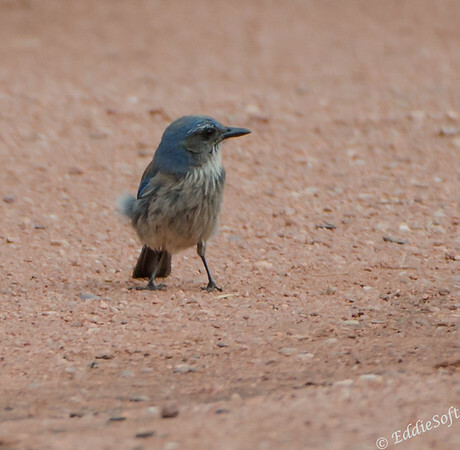 I only have a Scrub-Jay in California, nowhere else out West, so no Western Scrub-Jay. I was taking a picture of it while it was sitting up at the top of an extremely tall pine tree a half block away through backyards, and then it took off and attacked me! I was watching it in the viewfinder of my camera and it just came straight for my head until I ducked. Then it sat in the overhanging bushes over my head and kept yelling at me and flying around. 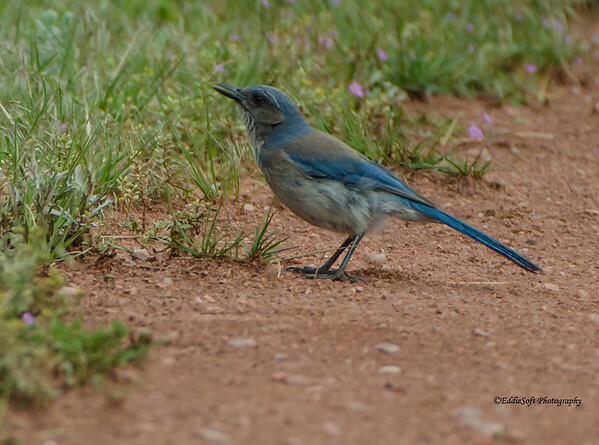 I hate the California Scrub-Jay, and I’m glad the Woodhouse’s Scrub-Jays kicked it out of their family. 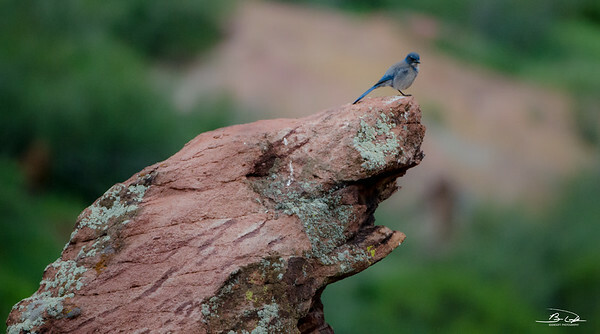 The other reason that the Scrub-Jay is an excellent addition to the Bear rock is that it shows that the Bear rock is the correct size for a bear! A big bear, but nonetheless I think it locks in the bear profile instantly. That’s a great picture, really memorable. Again, a candidate for a county fair. And I absolutely claim that there are Blackhawks around! There was even a tribe around here with that name! And a hockey team! And a huge statue of Chief Blackhawk. It’s unbelievable that you would doubt that. A hawk that is black is a Blackhawk. Simple. I’ve seen thousands of ’em. They should really be called the Common Blackhawk. Or the “Doerfler’s (not Brian) Blackhawk”. Very nice pics, though. Love that bear rock shot. So you have a bird I do not have – the California variety. Very nice. Some day Linda and I will get out to that coastline and pick up that bird along with the Acorn Woodpecker you hold over me as well. What is it with you and the attacking birds. Were you a Cowbird in a past life or something!?! I swear its like there’s an APB out on your profile (or a John Wick type contract out on your head). I’ll be standing there pleasantly enjoying shooting a cute tiny harmless hummingbird – you show up and the damn thing turns into demon hummer and goes on full out blitzkrieg. We might have to do some field experiments to get to the bottom of this. Right now you are a liability on our bird outings. Speaking of another mystery we need to get to the bottom of, the Blackhawk. Audubon actually declares that there are 250 pairs of Common Black Hawks (doesn’t sound too common to me) in the US. I looked at their regions and it looks like a small opportunity in lower Texas tip and a few small spots in Arizona/New Mexico. Cornell doesn’t really address it at all so it must not exist!